Carers in Hertfordshire is dedicated to making a positive difference to the lives of local unpaid carers. By selecting us as your Charity of the Year or Charity Partner you can be a crucial part of our important work identifying and supporting carers. Your support can enrich your brand with qualities that customers and suppliers care about. Your commitment to our cause through partnership can help to motivate and inspire your members, employees, customers and suppliers in positive ways - raising money and awareness for us, which helps carers, the community and your brand. • Display the Carers in Hertfordshire logo on your website as well as having visibility on our website to demonstrate your commitment to the community and engage your clients or members. With around 3,700 visits to our website each month there is the chance more traffic will be driven to your website too. Together we will develop an exciting and mutually beneficial partnership by supporting your events and helping you to engage the enthusiasm of your members, employees and customers. Join the many organisations who have chosen to support us. 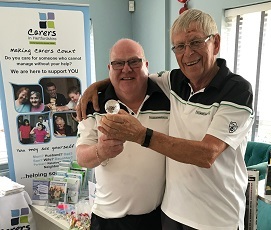 The Broxbourne Seniors, a golf section that play at Cheshunt Park Golf Centre, are supporting us after the Seniors Captain David Wigmore chose us as their Charity of the Year. This is the third year the Section has partnered with us as we were grateful to Phil Popham the 2017 Captain and Danny Deveney the 2016 Captain for nominating to help us after they learnt about our work identifying and supporting unpaid carers. David held a successful Captain’s Day on July 17th 2018 at Cheshunt Park Golf Centre, Cheshunt. Already, this year the Broxbourne Seniors have donated around £500, raised from collections. You can get in touch with Cheshunt Park Golf Centre by calling 01992 624009. Stevenage Borough Council - We are delighted that the Mayor of Stevenage for 2018/19, Cllr Margaret Notley, has chosen Carers in Hertfordshire as one of the charities she is supporting whilst Mayor. Cllr Notley took up the role in May 2018 and serves until May 2019 and has already supported us at Stevenage Day and a Charities Garden Party that was held on September 2nd and well attended by around 140 people. Other events planned include a quiz night; Christmas Carol Concert and lots more in the New Year. Cllr Notley, who has been a councillor for 18 years and before that served from 1992 -1996 said: “I am delighted to serve as Mayor and will use the opportunity to support the many local groups that work to make Stevenage an even better place and such a strong community. We’re delighted to have been chosen as the Local Charity of the Year for three Sainsbury’s stores – Letchworth (Third Avenue), Stevenage (Magpie Crescent) and Marshalwick Lane in St Albans. Staff and customers chose Carers in Hertfordshire to be the stores Local Charity of the Year through a vote in store and online in June 2018. The partnerships will last a year and staff will help raise funds and awareness for our work identifying unpaid family and friend carers and providing free advice and support for them. • Quiz nights and more.